We were just mentioning how we wanted to stay on FPVD’s trail yesterday morning, after the stock had shown us a nice 64% move on Tuesday. We identified .036 as a key point of resistance that we wanted to see broken, and not only did that happen, but the stock smashed through and kept on running to an impressive new high. The previous resistance we mentioned at .036 will now be the level FPVD will need to hold support at or above in order to maintain our attention going forward. We’ve had some excellent fortune recently with earnings-related options plays in the retail sector, and the opportunity to take advantage of yet another one may be ready to present itself today in the form of WMT. Increased revenue for the quarter has led the retail giant to increase guidance for the remainder of the year, and the news is causing a notable gap-up here in the premarket. As the activity unfolds, we’ll be looking to possibly take advantage of WMT Weekly $73.50-76 Calls. Yesterday, we mentioned how we caught MAXD on Friday morning for a timely 49% rip as the stock ran from .0043 to .0064 that afternoon. 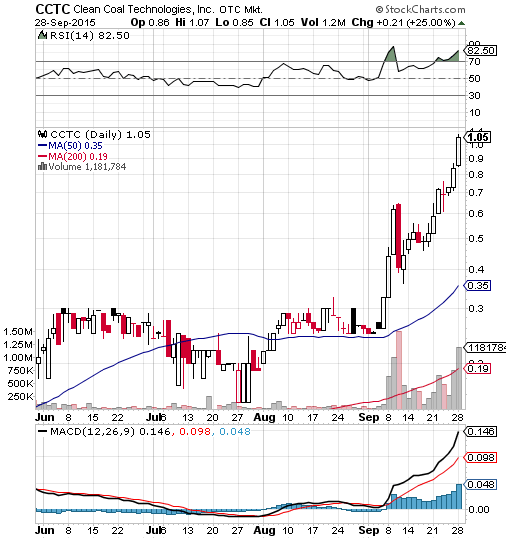 The stock closed at .0079, having registered its fifth consecutive session of higher lows and higher highs. We’ll be looking out for the possibility of a continuation in that pattern moving forward. That was followed by a dip and rip maneuver which brought it back to .0029 before undergoing a 34% bounce to the closing price of .0039. We had also tagged BILB for observation in yesterday’s report, and it too enjoyed a big intraday run first thing in the morning before tuckering out early. The stock traded up from .0027 to .0054 right from the opening bell for a nice round 100% jump. NFLX shares are reacting poorly to the company’s post-market earnings report yesterday afternoon, and so we’d like to make note of a range of bearish options ideas. We’re going to be looking to the NFLX Weekly $88-85.50 Puts for possible intraday swing trade chances, provided NFLX doesn’t break back above the $88-level. SPDR S&P 500 ETF (SPY) – The SPY is one of our favorite funds to take advantage of when market conditions permit, and based on the general atmosphere this morning after crude oil’s impressive rally yesterday, we definitely want to signal a range of contracts for tracking. We’re specifically looking for the heaviest activity to fall within the SPY Weekly $187-191 Calls*, with the SPY trading in the $189-range here in the premarket. If we do see a dip to start the day, we’ll need the subsequent bounce to occur above that $187-level for this idea to remain valid. *Don’t forget that trading weekly options contracts on a Friday is an inherently risky proposition, as they are on the verge of expiration. It can, however, be a chance for experienced traders to take advantage as premiums dissipate and volatility increases. DECN was included in our pool of interests from yesterday’s premarket report, and the stock went on to put up a respectable performance. From a low of .15, DECN ran as high as .24 for potential intraday gains of up to 60% and the move happened with the aid of roughly nine times the monthly average volume. There have been a couple of events that have TUBE flirting with new relative lows this week. A nominal amount of insider selling seems to have coincided with some third-party content in its news feed casting the stock in a disparaging light. Events like these awaken the bargain hunters within us. 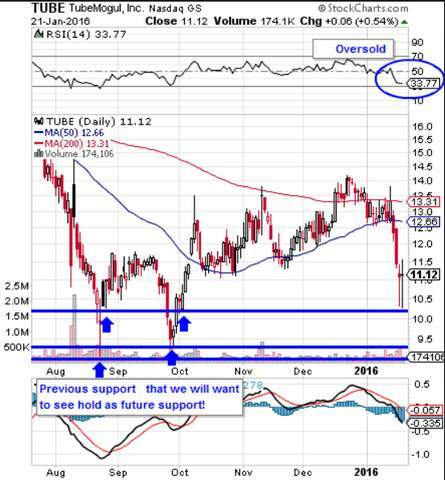 The stock is approaching previous levels of support as we’ve pointed out on the chart below, so we’ll be monitoring for a possible reversal to occur in that channel in forthcoming sessions. We’ve noticed SYRG trending up off of its own recent bottom over the past couple of sessions, and we like the overall look of the chart and the strength building therein. We’re looking for this stock to record higher highs and higher lows and continue to build momentum.